By now, just about everybody should know the tragic story of The Phantom of the Opera, the 1910 Gaston Leroux novel turned into a mega-blockbuster stage musical by Andrew Lloyd Webber in 1986. Young chorus girl Christine Daae (the scrumptious Emmy Rossum, Mystic River) has been taken under the wing of a mysterious tutor since her childhood. That figure in the darkness, the victim of ghastly deeds in his own youth, is head over heels in love with the lass and sees to it, through his ghostly ways, that she rises to the top of the cast of the Opera Populaire. Of course, this phantom doesn’t take it all that well when another young suitor, Raoul (Patrick Wilson, The Alamo), also seeks to earn the love of Christine. Murder, mayhem, and loads of music ensue. While this Phantom is a more straightforward adaptation of its stage progenitor than Chicago’s film version, it’s still been made with equal amounts of tender loving care and innovation. Schumacher and Lloyd Webber also smartly open up the production, taking full advantage of the cinematic experience with some new action sequences and added dramatic heft, leading to a slightly modified program that serves as a near-perfect companion piece. 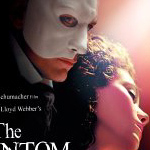 The movie’s biggest mistake is that Gerard Butler is too handsome as the Phantom. That’s not to knock Butler; he gives a fine performance and he delivers surprisingly solid vocals. Even his irrepressible Scottish brogue adds a certain dimension, giving further distinction to a character out of place with the rest of the denizens. But, darn it, give the man a scar or a furled lip on the unmasked portion of his face. After all, what woman would take issue with a stunning voice, a bad boy demeanor, and a 62% perfect face? Even the “scary” hidden 38% isn’t nearly as hideous as the original stage production’s incarnation. Nonetheless, Butler covers ground here that is a long way from his somewhat rigid rogue in Lara Croft Tomb Raider: The Cradle of Life. Helping to offset the lack of grotesque physical traits, he does get the opportunity to be more menacing as this cinematic Phantom and some of his back story, missing from the stage show, has been restored. Perhaps the biggest casting surprise is Minnie Driver (GoldenEye), who puts in more Italian bite than most of the (much physically larger) divas typically cast in the stage role of Carlotta, the pre-Madonna Prima Donna. She’s the only one who doesn’t do her own singing on screen, but she does give Schumacher the ideal vehicle to ham it up, while still being restrained by Lloyd Webber’s protective, lordly hands. And so it is that Phantom has made the leap from stage to screen. However, a strong argument can be made that Lloyd Webber’s best work took the exact opposite route. Sunset Blvd., based on Billy Wilder’s classic movie, encapsulated all that could be expected from a Lloyd Webber musical: grandiosity, bombast, high drama, and some of his best songs. Lacking the instant familiarity of the Phantom, Lloyd Webber inexplicably pulled the plug, prematurely, on both the London and New York productions of Sunset Blvd.. It could’ve been big, but the audiences got small. It’s only fitting, then, that this cinematic Phantom, buoyed by a 105-piece orchestra and 95-voice choir, succeeds with newfound oomph and spectacle. Special note should be made of the Masquerade scene. Unlike the Technicolor costuming of the stage show, everybody’s dressed in shades of black and white – except for the Phantom himself. The costumers might have had their own “artistic” vision in mind, but it also serves as a fitting homage to the classic black-and-white Lon Chaney film’s infamous staircase scene(which is the one scene from that film that was presented to audiences in an early form of Technicolor). While this cinematic Phantom turned out to be an utterly surprising creative success, bear in mind, dear reader, that seeing the movie is no excuse for not seeing the stage show, much like seeing a movie is no excuse to not read the book; they are unique, supplemental experiences. Warner Bros. was one of the first proponents of the DVD format, originally named Digital Versatile Disc. It’s sad, then, that the company has resorted to a silly exercise of marketing three different Phantom DVD packages. There’s the Widescreen Edition, Full Screen (for those who don’t understand the significance of seeing the movie as the director originally intended), and the 2-Disc Special Edition in Widescreen. The difference in suggested retail price between the movie-only editions and special edition is a measly $2 (which, in turn, is cut to $1 on Amazon). Instead of wasting budget on marketing, manufacturing, tracking, and distributing the three different editions, Warners should have spent the money on one edition to rule them all, with more bonus supplements and both full and wide editions (that’s the way they were packaged in the golden days of just a few years ago; who, after all, is going to buy both full and widescreen versions?). Such as they are, the supplements are good, but a commentary by Lloyd Webber and Schumacher is sorely missed and surely could have been an enlightening lesson on stage versus screen. It’s unfortunate no such track was recorded. Instead, the Special Edition’s second disc offers an hour-long documentary on the making of the stage show, including snippets from the original cast as well as the London company in September 2004. There are some juicy bits (why the mask covers only half of the Phantom’s face, for example, while the posters show a full-face mask). It’s worthwhile viewing, particularly to pick up on casting and directorial choices that didn’t happen. O to consider if only one small thing was done differently what fate might have befallen the Phantom. The second documentary, a 45-minute feature, focuses on the making of the film. It’s good enough to pass muster, but there has to be more story to tell on the Phantom’s odyssey from Lloyd Webber’s first household presentation to the silver screen. Also on hand is a deleted scene of the Phantom singing No One Would Listen, a new song not included in the theatrical production. It’s a nice addition, but nothing to watch over and over and over again. It’s a slow tune, no doubt cut because it would drag down the film’s pacing (besides, Lloyd Webber eventually rewrote it as Learn to Be Lonely, which was sung by Minnie Driver herself during the film’s end credits and went on to receive an Oscar nomination for Best Original Song). The DVD-ROM “bonus features” are bogus. They’re simply links to the official Phantom Web site and other Warner Bros. propaganda. It’s a waste of time moving the disc from DVD player to PC, so here’s the link to the Phantom’s cyber home: http://www.phantomthemovie.com. The Phantom of the Opera is a sumptuous production gorgeously transferred to DVD. The picture is crisp, vibrant, and gloriously colorful. The Dolby Digital 5.1 Surround sound, available in English and French, is also fantastic. Turn it up to 11 and enjoy the show as it transforms your abode into your very own Garnier Opera House. Subtitles in English, French, and Spanish are also on board.